Welcome everyone to this special service this morning. At the conclusion of this service you are warmly invited to join the Burge family for a cup of tea and something to eat in the church hall. We have come here today to thank the LORD for the life of David Burge. His was a remarkable life, and even in our grief, we don’t want to forget that he was a wonderful gift from God. We want to thank God for that gift. We also want to show our support to Dave’s immediate family. We want to stand beside you and share this time with you. We who are here today are but a small percentage of those all around the world who are praying for you. We want you to know that we cared about him, and we care about you. With any death there can be a sense of unfinished business, things we wish we had said – or hadn’t said. This is a special time and place to say some of the things which we might not want to leave unsaid. This morning is an opportunity for any who want to say some of those things to say them out loud. Some will feel more comfortable saying them before God in their hearts – and that’s OK too. This is also a time and place for many of us to reaffirm our faith and trust in God. We have to admit that with David’s death that faith has been shaken. But God is our refuge, and by his strength our faith will outlast our grief. We believe in the one who said that he is the resurrection and the life. He proved what he said by being raised from the dead himself. We grieve today because the hurt is real, but we do not sorrow like those who have no hope. Our hope is in someone stronger than our hurt. Heavenly Father, we want to thank you for the 42 years of life that you gave your servant, David Burge. At some point in our lives, we came to know this remarkable servant of yours, and our lives have been blessed forever because we did. He was one of those people that you could always count on for a word of encouragement. He had a down to earth wisdom about him, which was actually a great gift from heaven. He salted everything he said with a most delightful sense of humour. We are going to miss him terribly. Father, forgive us if there have been times when we have failed David. Enable us by your grace to forgive anything that was hurtful to us. Set us free from our sins, grant us healing and wholeness. Speak to us now through the words we share with one another, and through the words of scripture, the source of David’s faith, that our own faith may be strengthened and renewed. We pray in Jesus’ name, Amen. I declare to you, brothers, that flesh and blood cannot inherit the kingdom of God, nor does the perishable inherit the imperishable. Listen, I tell you a mystery: We will not all sleep, but we will all be changed– in a flash, in the twinkling of an eye, at the last trumpet. For the trumpet will sound, the dead will be raised imperishable, and we will be changed. For the perishable must clothe itself with the imperishable, and the mortal with immortality. When the perishable has been clothed with the imperishable, and the mortal with immortality, then the saying that is written will come true: “Death has been swallowed up in victory.” “Where, O death, is your victory? Where, O death, is your sting?” The sting of death is sin, and the power of sin is the law. But thanks be to God! He gives us the victory through our Lord Jesus Christ. Therefore, my dear brothers, stand firm. Let nothing move you. Always give yourselves fully to the work of the Lord, because you know that your labor in the Lord is not in vain. Some time ago David and Tarnya asked me to share this message. They wanted us to not only celebrate David’s life, but to rejoice in David’s hope – a literal resurrection when Christ returns to this earth. I. In 1 Corinthians 15, Paul argues that THE NEXT YOU IS GUARANTEED. IT IS BASED UPON HISTORICAL FACTS. 1) Christ was raised from the dead, and when Paul wrote these words there were still many witness to that fact (3-8); The new Him is proof that there will be a new you. 5) Everyone who has suffered in ministry has demonstrated faith in the next you (30-32). Paul’s argument is that every aspect of the Christian faith and life points toward the next you. Every breath you take in this life, every word you say, everything you do, is a precursor to that permanent expression of you-ness in the next life. Rather than implying that this life is meaningless compared to the next, Paul implies the opposite. This life is important because it sets the stage for the main event throughout eternity. The next you will validate the significance of the present you. The present you is an investment in the future you. II. In 1 Corinthians 15, Paul argues that THE NEXT YOU IS INTENDED BY GOD, AND WILL HAPPEN ACCORDING TO HIS TIMETABLE. 1 Corinthians 15:51-52 Listen, I tell you a mystery: We will not all sleep, but we will all be changed– in a flash, in the twinkling of an eye, at the last trumpet. For the trumpet will sound, the dead will be raised imperishable, and we will be changed. 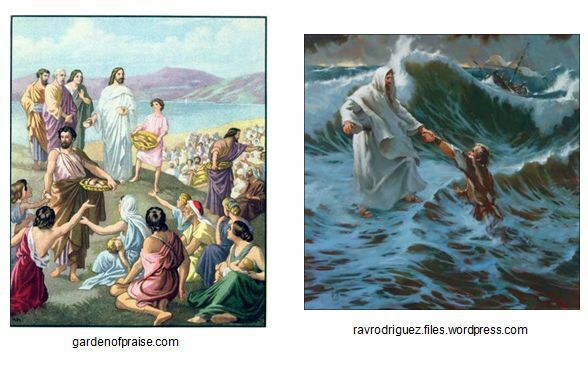 4) The end (of the harvest) which is the final resurrection of all the remaining dead (24) (see Rev. 20). The resurrection, then, should not be just a minor blip on our theological radar screens. It belongs to those events by which God is shaping the destiny of his universe. In his providence, the next you is just as important as creation, the exodus, the incarnation, the cross, or Christ’s resurrection. Seen in that light, your existence today takes on new significance. You may think of yourself as caterpillar-like, but God has planned your butterfly-hood! III. In 1 Corinthians 15, Paul argues that THE NEXT YOU IS NOT SIMPLY A RESUSCITATION OF YOUR BODY. YOU WILL BE THE SAME PERSON, BUT WITH A NEW GLORIOUS IMMORTAL NATURE. Paul’s argument is that the next you will be the same you – only different. The seed and plant analogy assures that you will be the same person. 1 Corinthians 15:37 When you sow, you do not plant the body that will be, but just a seed, perhaps of wheat or of something else. The resurrection is not a re-creation, starting over with all-new materials (and hopefully getting it right this time). No, the seed and plant analogy speaks of a continuation of a life with which God originally intended to bless his universe forever. Sin entered your life and corrupted it, making it necessary for you to die. But God loves you too much to let that be the last note of your song. The resurrected you will be the same you, purged of all those things that cannot abide eternal existence, and transformed into something extraordinary. The different flesh/ splendour analogies assure that your nature will be different (39-41). The next you will be as different from the present you as humans are different from animals. The difference will be as pronounced as the difference between celestial and terrestrial bodies. The Adam/Christ analogy explains the essence of that transformation. 1 Corinthians 15:49-50 And just as we have borne the likeness of the earthly man, so shall we bear the likeness of the man from heaven. I declare to you, brothers, that flesh and blood cannot inherit the kingdom of God, nor does the perishable inherit the imperishable. Your new nature will “bear the likeness” of Jesus Christ! (49). All those inherited predispositions and character flaws and physical defects which identified you with your ancestors Adam and Eve will have been replaced. The stuff that the next you will be made of is described as “from heaven” (49) and “imperishable” (50). IV. In 1 Corinthians 15, Paul argues that THE NEXT YOU IS NOT JUST AN ADDED BONUS TO YOUR SALVATION, IT IS ABSOLUTELY ESSENTIAL. Your future state is imperishable and immortal. The next you is more than just a revived you. The next you will be you as God intended you to be. By his death on Calvary’s cross, Christ won the battle which has made the next you possible, but you have not yet received all the spoils of the victory personally. Paul described his resurrection chapter as essentially the gospel message that he preached (1-2). It is right for believers to emphasise the benefits we already have because of the death of Christ: forgiveness of sins, permission to approach God in prayer, guidance from the indwelling Holy Spirit, etc. But let us never forget that the gospel is not complete if it stops there. You have not heard the whole gospel if the message you have heard fails to include the next you. 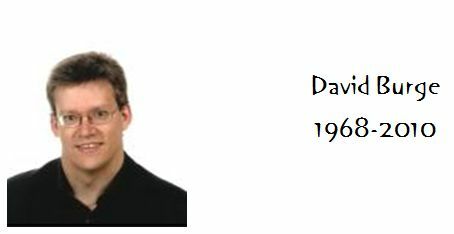 Heavenly Father, we thank you for the privilege of having known your servant, David. We thank you for life’s lessons you have taught us through him. We thank you for the example he set for us as a son and grandson, as a husband, as a father, as a friend, and as a pastor. We thank you for the joy he brought us. We thank you for the wisdom he demonstrated. 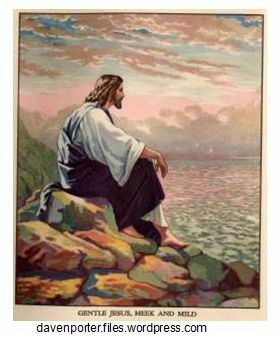 We thank you most of all for his faith in Jesus Christ, and for the hope that he had that we will see him again one day because of the power and love of Jesus Christ. We pray once again for all who mourn today. May they sense your arms around them. May they know your support and your healing. Give them assurance that you care for them all the time, and faith and courage for the days ahead. We ask this through Jesus Christ our Lord. Amen. We all know that David had a disease that he knew was likely to take him in the prime of his life. Before the leukaemia started taking up his time, he had the chance to step back from the busyness of life and concentrate on the things that were important to him. Obviously he spent much of that time with Tarnya and the kids. He also spent a good deal of time putting together some of his thoughts into writing. He has finished some books which will soon be all of ours to enjoy. But even those months are not enough. It is unfair that we have to say goodbye to David at all. Our only consolation is that we are not saying goodbye for good. We are only saying goodbye for now. Believing that Jesus is coming back to claim his own, we entrust David to the care of our ever loving God, in the sure and certain hope of the resurrection to eternal life. Our hope is in the Lord, who died, was buried, and who rose again for the forgiveness of the sins of all who believe. To God be the glory forever. Amen. And his disciples came and took the body and buried it, and they went and told Jesus. Now when Jesus heard this, he withdrew from there in a boat to a desolate place by himself. But when the crowds heard it, they followed him on foot from the towns. When he went ashore he saw a great crowd, and he had compassion on them and healed their sick. A brother, a son, a grandson, a pastor, a fellow believer has fallen. David Burge, pastor of this church, has died. He is a victim of a disease, and a victim of the mortality which effects us all. His life in this age, which held such promise for the kingdom of God – is now cut short. 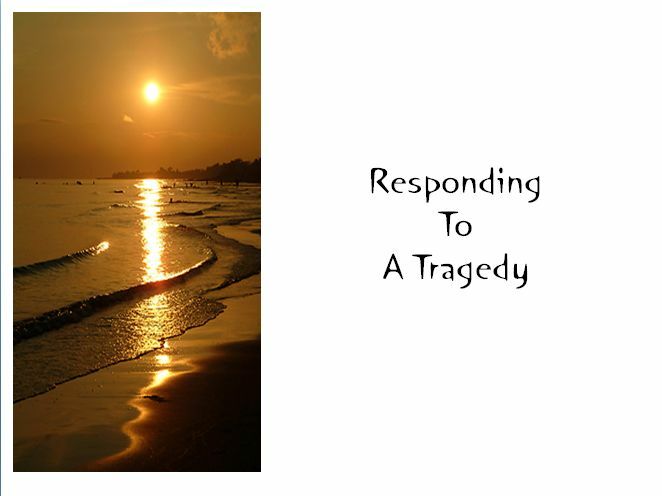 How do we as believers respond to such a tragedy? The enemy rejoices every time a godly man dies. Satan uses tragedies like this to convince people that there is no God – or that he, too is helpless to prevent evil. Surely there is a better response… a truly Christian response. We cannot allow our shock at this event to blind us to our call. Jesus called us to be perfect just as our heavenly father is perfect. That means responding with faith. That is what Jesus would do. In fact, that is what he did. First he withdrew. The maker of all things needed to get away from it all. The Lord of all time needed some time to himself. Surely we can understand that. John the Baptist was his friend. They shared a love for God and a call to the ministry. They were even related. And John died a death which served no purpose – except to accentuate the absolute futility that death represents. He was a great man – a true believer – a prophet of God. Yet he died because of jealousy and pride. He died because of the lust and foolishness of an irresponsible king. Jesus knew all things. In his mind he did not have to ask “why?” But in his heart he did. Our Lord needed time to deal emotionally with this senseless tragedy in his life. We are here today because we also need to withdraw. Like the disciples, we need to withdraw with Jesus, not from him. We need to process this terrible event. It didn’t just happen to David, or to his wonderful family. It happened to all of us here. We are still in shock. It’s hard for us to even think about ordinary things. We can only think of the pain, the fear, the distress, the confusion. In a way, we are all still fighting for our lives. Withdraw with me today. We will go privately to the solitude of our own hearts. And when we get there – we’ll have a little talk with God. Of course, we will not know what to say. Our hurt is too deep for words. But the precious Holy Spirit will be there – to communicate the sorrow we feel. And God will answer. He is there waiting in the church. He may not give an answer for the questions on our minds. But he does have answers for the questions on our hearts. In his deep sorrow, our Lord looked around him. And what he saw was the crowds that had followed him. He couldn’t get away from it all – because people needed him. When he needed time for emotional healing – the crowds kept seeking him for physical healing. But he didn’t send them away. He had every right to. He was not obligated by any law of man or God to continue working that day. But he chose to continue. He put others’ needs above his own sorrow. He allowed compassion to change his course. That is our Savior. He came to serve, not to be served. Matthew tells us that two great miracles happened that day. Jesus fed the 5000, and he walked on water. But perhaps the greatest miracle of all was our Lord’s decision to do ministry even in his own grief. David is a servant of Jesus Christ. He died while still working on ministry assignments. He cannot speak to us today. But if he could, he would probably tell us to live as he died. He would want us to never miss an opportunity to serve the Lord by serving others. Perhaps that is the best way for us to deal with our own sorrows. Our Lord is going to return to this earth one day – probably very soon. When he does return, he wants to find us busy loving and serving and giving. That’s what he is all about. That’s what we are all about. There is a world right here on the shores of our Galilee that needs the compassionate ministry of Christ. When he returns, may he find us sacrificially serving, just as David did… just as Jesus did. On behalf of the Takanini Church ministry team and the Burge family, I would like to thank you all for your prayers and support during this challenging time for us. May God bless you for being a blessing to us.